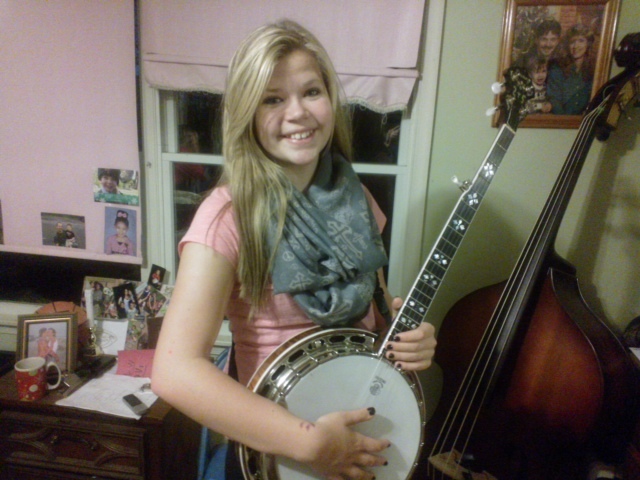 Posted in banjo and tagged guest posts, Kasey Smelser, learning to play on February 26, 2014 by admin. Do you REALLY want to learn to play? Over and over again for the last 40 years, I've heard people say, "I'd give ANYTHING to be able to play music like that." I try to say something appreciative in return, but I wonder if the speaker is serious. I've spent a lot of hours and life-energy learning to play. Every professional-level performer has done that. I started playing bluegrass at age 18, and I spent a lot of hours playing every day at it for the next several years, just to learn to pick. How many casual listeners would actually have done that, in order to play bluegrass? If you are learning to play, be serious about it. You don't have to play for six hours a day (few of us have as much time as teenagers do), but you do need to play some every day if you possibly can. Fifteen minutes a day is better than two hours on Saturday. Don't let your instrument start feeling strange to your fingers---play as often as you can, even if it's just for a short time. That's the way to keep learning. And once you do start learning, you can keep learning for the rest of your life! You don't have to "give ANYTHING" to learn to play, but you do need to give something each day. Good picking! Posted in By Red, General and tagged learning to play on August 25, 2009 by admin. I was planning on talking about improvising today, but we got such a nice response to my first blog, asking how I learned to play that I thought I could justify taking off on that side road for a bit. I got into bluegrass courtesy of the great Gamble Rogers. In the early seventies, I was attending the University of Georgia, in Athens, where instead of concentrating on my pre-med studies, I was spending large quantities of time at a club called the Last Resort, watching Gamble pick his guitar, Merle Travis style, and spin tall tales. One night Gamble told the crowd that there was a bluegrass festival in nearby Lavonia, Georgia, and that we should all go. He was going. Well, if Gamble had said we should all jump off the Tallahatchie Bridge, I’d have been the first one in the water. My friend Paula Lane (where are you now Paula?) and I went and not only did I see my first live bluegrass, I also met my future husband, Bryan “Red” Henry. Gamble introduced us around a campfire. Red was drinking something out of a Mason jar that looked suspiciously like water. He didn’t remember me, but I remembered him! Shortly after that, I got my first banjo and commenced learning to play. My friend Buddy Blackmon showed me a few things but mostly, at first, I tried learning from the Earl Scruggs Book. Yes, I was using tablature. That’s why I know it doesn’t work! And, hey, I had a musical background. I could read music enough to play church piano, could play guitar by ear, and had taken a year or so of violin. I was not musically ignorant nor slow on the uptake. Still I hadn’t heard much bluegrass and I didn’t know what the songs were supposed to sound like! So I struggled with the tab, circling eighth notes because they lasted longer, and trying to make some sense of the music. (You should see my Scruggs book. It’s all marked up!) The results were pitiful. Posted in By Murphy, Learning By Ear and tagged Learning By Ear, learning to play, murphy on July 8, 2008 by Murphy Henry.